Be Careful who you are messing with, An attacker realized he picked a wrong victim when the victim decided to spend $20,000 to find him. Roger Ver, the man known as "Bitcoin Jesus, who is the Angel investor in lots of Bitcoin startups, announced a 37.6BTC reward(about $20k) for information that leads to the arrest of the hacker who hijacked his Hotmail account and threatened to ruin his life. It all started when the hacker managed to hijack an old Hotmail account of Roger by answering the security questions. According to reddit, the attacker used the hotmail account to gain access to Roger's old facebook account and one of his domain accounts at register.com. The attacker also attempts to hack his primary email account and domain name. The attacker using the screen name 'savaged' contacted Roger via Skype and demanded "37.63289114 BTC"
"I think we both know this won't be pleasent and let's be honest there is nothing you can do to have me caught, I've been around too long" The attacker said. "Let's be honest I will sell [SSN REDACTED] + your information to fraudsters that will credit f*** you then get your moms social and credit f*** her too and ruin both your lives"
The hacker also claimed he is the one who hacked @UberFacts twitter account which has 6.7 M followers. But, Roger decided to follow a technique used in the movie called 'Ransom': Rather than giving the money to criminals, he posted he was putting a bounty on the hacker instead. 37.6 BTC reward for information that leads to the arrest of the hacker that is trying to hack all my stuff at the moment. details to come! 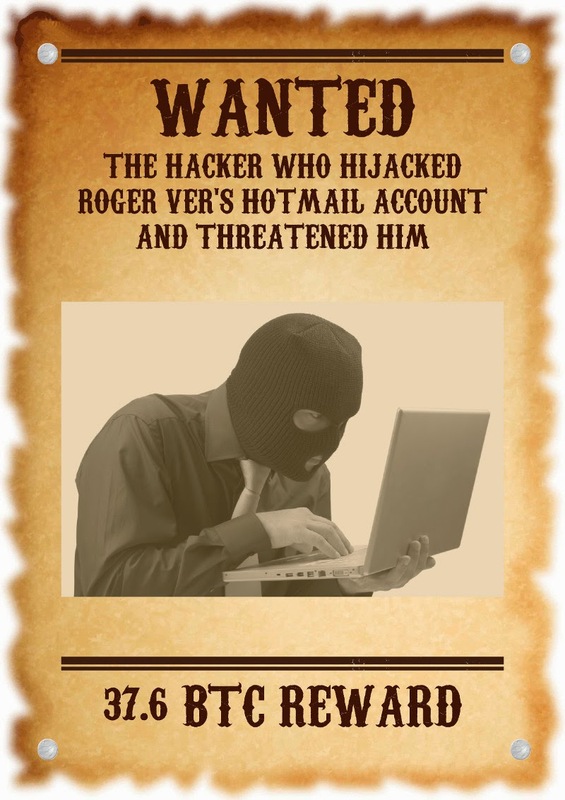 When the attacker learned of the bounty on his head, he got scared and deleted Roger's hotmail and gave the password for all other accounts and ran away. "I just need to raise funds for my mother, but since you aren't going to help, all your passwords are: Nigger55" The person on the end of skype said. "Goodbye, Sir, I am sincerely sorry I am just a middleman I was being told what to tell you." Roger said in his tweets the things are back to control and not a single Bitcoin was stolen.